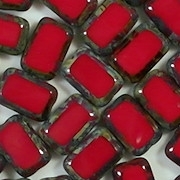 12mm (long) x 8mm (wide) polished rectangles, about 3mm thick. 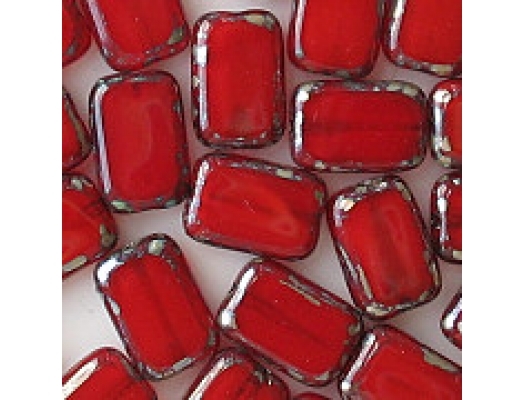 A mixture of bright milky and translucent reds with a silvery picasso coating around the edges. 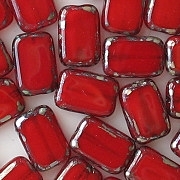 Some beads are all translucent, and some are all opaque, and some are a mixture. I eliminate seriously defective beads before shipping. That includes beads with cracks, deep or long scratches, partially polished windows, large pits, and large spots of picasso coating on the windows. However, I don't count very small pits, small nicks, very shallow scratches that are hard to see, or small spots of picasso coating on the windows as defects. Also, if picasso coating got in the holes, making them dark, and you can see them through the glass, I don't count that as a defect. 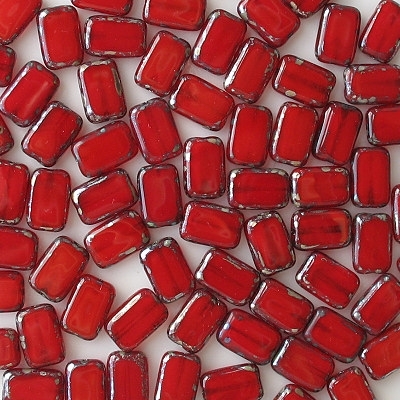 If you receive any beads with serious defects, that means that I overlooked them, and you should contact me for a partial refund. Added later: While working with these beads, I noticed that some "windows" are not thoroughly polished, giving them a slightly matte look. I am eliminating the worst of those beads, but not the ones which have some shine to them. I just can't afford to eliminate all of them. If you are dissatisfied, let me know. I originally got these beads to replace the dark oxblood rectangles, but I came to like them all on their own.